Reimburse Your Teen’s Uber And Lyft Rides — Here’s one thing you might consider reimbursing for your teens. No questions asked. Decide Who’s Taking The Lead On Your Kid’s Financial Education — Don’t let the ball drop between parents when it comes to your child’s money schooling. 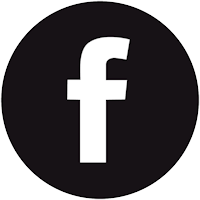 See which parent is taking the lead most often in FamZoo families. 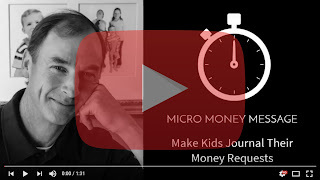 Ditch Directives And Tell Kids Real Money Stories — Kids don’t listen to “Don’t do this!” and “Always do that!” Tell some real money failure stories about yourself to make the lessons stick. The more of a money moron you were, the better. Here’s an example. Sometimes asking mom and dad for extra money is just a little too easy. Not that kids are nefarious or anything, but harried parents are a pretty easy con. There’s a simple solution for putting the brakes on impulsive, redundant, or (dare I say?) exploitative money requests from the kids. Force your kids to write it down. Make’em maintain a little money request journal. and a Running Total so everyone can clearly see the money stacking up. By the way, If you want to ditch the pen and paper and go New School, you could use a shared Google Docs sheet or an app instead. Now, to get money out of you, kids have to take the time to fill out a new entry and seek your formal approval. It’s amazing how a little thought, a little transparency, a little history, and, yes, even a little red tape can put some big brakes on impulsive spending. 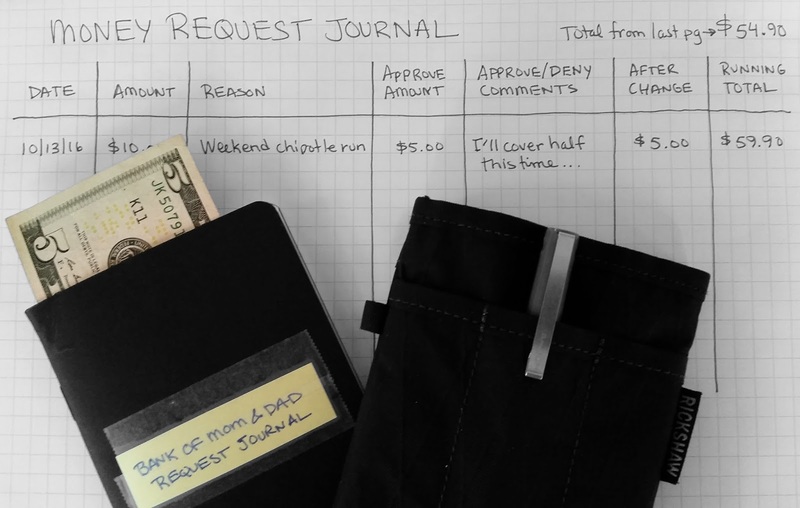 With a money request journal, duping Mom and Dad out of extra dollars just got a whole lot harder. 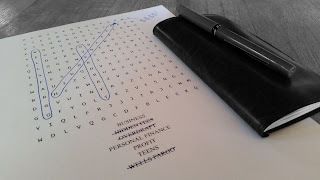 A basic check writing unit is a staple of the traditional high school personal finance curriculum. I say ditch that unit. I don’t care if my kids never learn how to write checks. Why? Almost all of the overdraft fees incurred by my older two kids were due to hand-written checks. A forgotten check cashed late. A remembered check cashed unexpectedly early. Whenever there’s a significant delay between payment being initiated and funds being withdrawn, there’s a financial accident just waiting to happen. Especially for those who don’t maintain healthy buffers in their accounts. Like your teens. That nefarious pay-now-withdraw-later delay exists with checks, and it exists with credit cards. That’s why inexperienced or stretched consumers struggle with both. That’s why banks love both. Cha-ching. Hand-written checks are nothing more than a gateway to bank overdraft fees. No thanks. I teach my kid how to use online bill pay instead. The bank handles cutting the check and withdraws the funds promptly. No delay. Nothing to remember. No timing games to play. No overdraft. No worries. 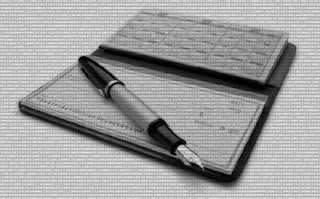 I say: Grown-ups don’t write checks, Luddites do. P.S. Your teens should ditch cash too. Except for a little backup stash in the shoe. Umm. Let me think about tha... YESSSSSS!!! You see, my son has been working a part time job during the school year. Compensation includes a share of the cash in the tip jar at the end of each shift. That’s just the kind of money that tends to evaporate in a college environment. The cash is at your fingertips. Tip income feels like an extra “bonus.” Dropping bucks here and there with your buddies is a constant lure. On the other hand, accumulating cash in your wallet, loading it on to your spending card, and requesting your dad to whisk it away to savings seems almost inconceivable. Starting early, talking often. 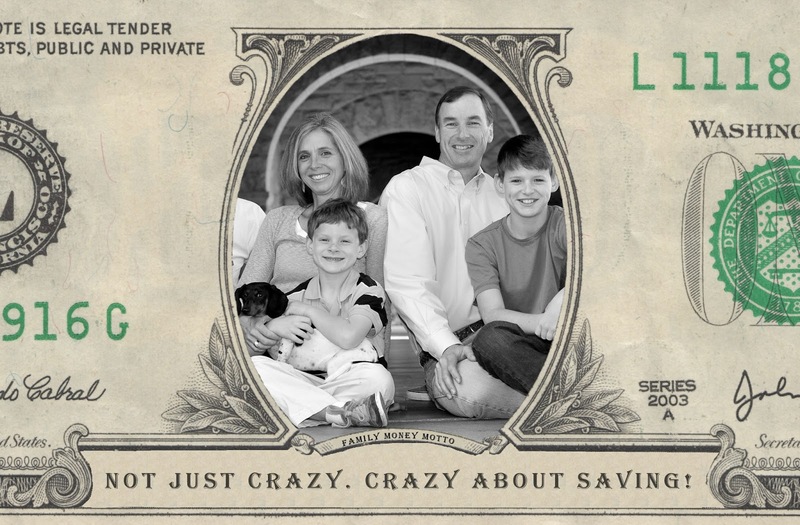 I opened a virtual family banking account for my son when he was 7 years old. That was the start of an ongoing personal finance dialog. 14 years and counting. The sooner you start talking openly about money with your kids, the better. 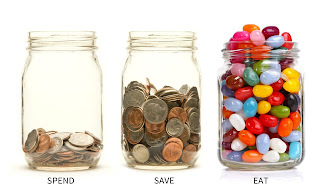 Establishing a separate savings bucket. Savings won’t survive when it’s mixed in with spending. 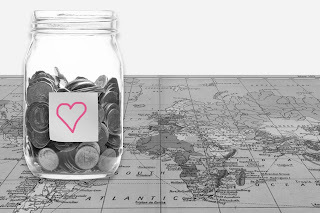 Teach your kids how to separate their funds into compartments with specific purposes. Start with the standard three: spending, saving, and giving. Splitting income between buckets. Whenever income rolls in — be it allowance, chore payments, odd job income, or birthday checks from grandma — instill the habit of allocating each deposit between the different buckets. Be sure to let your child have a say in what that allocation looks like. They just might surprise you. Rewarding saving with aggressive parent paid interest. Show your kids the power of compound interest in a timeframe they can appreciate. A traditional bank savings account with near zero annual interest rates simply won’t cut it. Pay interest on your kid’s savings yourself. Be generous and frequent to make the point. Who knows? 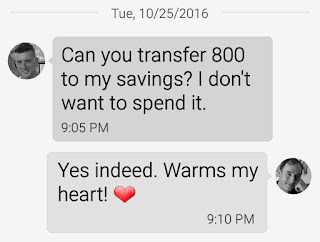 If you set the savings stage early, you might just look forward to texts from your college kids about money, instead of dreading them like most parents. If you’ve parented a teen, I’m sure you’ve dished out some of those classic admonishments — and then some. Teens are notorious for risky behavior. It comes with the surging hormones and the under-developed frontal lobe. But there’s one area that teens need to pump up the risk if they’d like to enjoy a healthy future. Investing. According to recent research featured in the Wall Street Journal, the biggest money mistake people make in their 20s these days is playing it too safe. 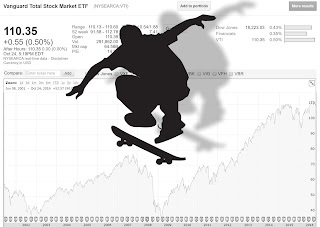 They think investing in the market is too risky or too complicated. 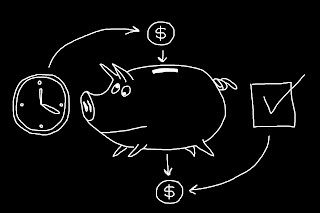 Most teens I know never get beyond plunking some money in a traditional savings account, if they save any money at all. Help your teen to get a W-2 paying job. We focused on summer jobs with our kids, but don’t be too quick to dismiss part-time work while in school. Part-time work for full-time students has benefits. Open a Roth IRA account. You can start with a custodial account for kids under 18. I opened ones for my teens at a local Schwab office, but there are lots of options here. Contribute some earnings. Convince your kid to stash away some percentage of each paycheck into a savings account or a savings card. At the end of the summer or the year, roll the savings balance over to the Roth as an annual contribution. Invest the contribution. Don’t just let the contribution sit there in cash. This is where it’s time to accept some medium term risk for long term returns. We’re talking decades. Consider a low cost, well diversified, broad market index fund or ETF. Rinse and repeat through college. Make it an annual tradition all the way through that college diploma. You’ll struggle to get past step 3 though if you don’t show your teens some serious payoff. You can run some very impressive scenarios in a very simple spreadsheet. Copy mine here, and play with the numbers. 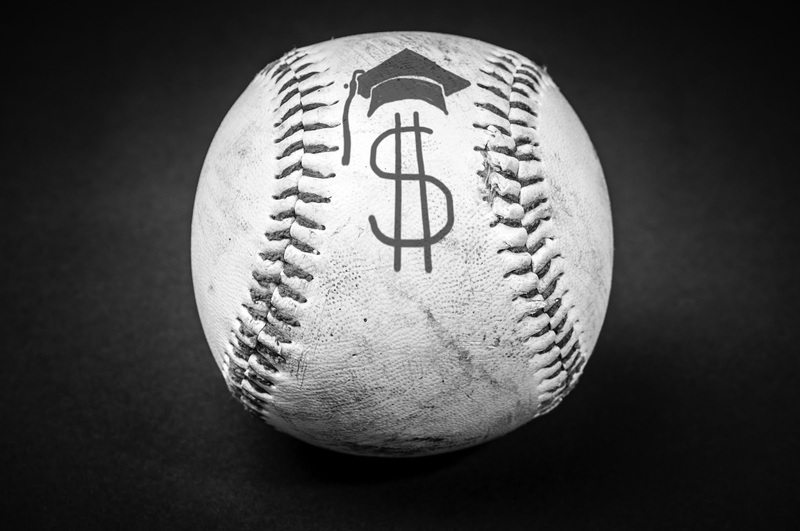 Even better, if that student ritual turns into a persistent habit of maxing out IRA contributions and sensible investing as an adult, your kid will be sitting on well over a million by retirement. Run the numbers in the spreadsheet. What are your family’s core beliefs about money? Can you encapsulate them in just a few words? That’s not an easy question to answer off the cuff. Do you think your other family members would come up with similar words? Is everybody on the same page? Maybe it’s time to identify and adopt a family money motto. You can find a lot more on our Wise Money Words Pinterest board. Well? What’s your family money motto? Behavioral finance informs us that rational thought doesn’t always govern personal finance decisions. Lots of money behaviors are purely emotional or even seemingly random. For example, people who could save and know they should save, often just don’t. That’s why a new crop of apps that save “behind your back” (like Digit) or save based on random emotional triggers (like Tip Yourself) are all the rage recently. 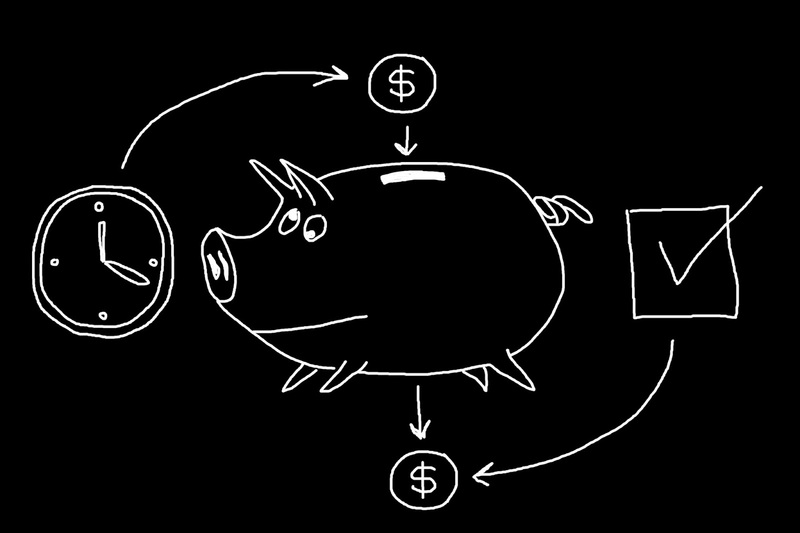 The apps transfer money from your spending to your savings account using unscheduled or unconventional triggers. In that same vein, I have a quirky idea for parents out there. With hormones raging and frontal lobes developing, your teenager is the perfect unpredictable, emotional trigger. Every time your teen does something irrational, incomprehensible, or irresponsible, transfer a dollar to your savings. 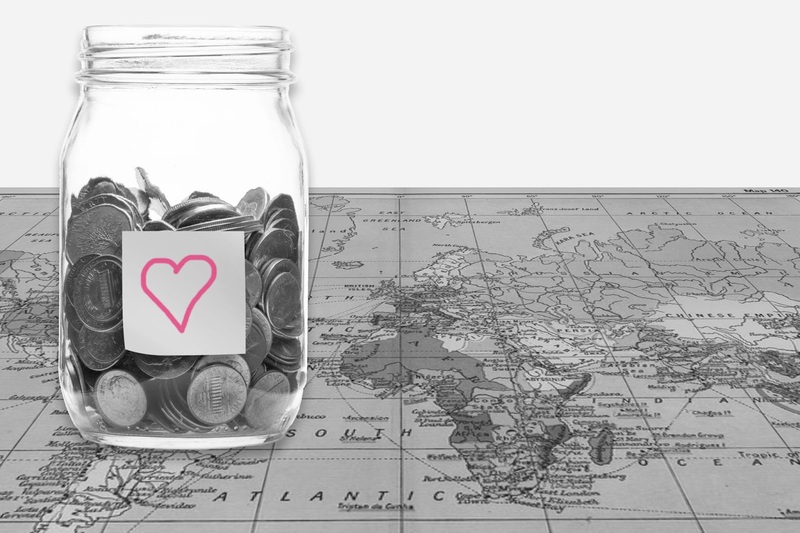 Build up your emergency fund, your vacation account, or your family fun money card. If your teen is like most, you’ll be swimming in extra savings in no time! If you’re going to have to endure a teen’s perplexing behavior, you may as well put some extra money away while you’re suffering through it. Yes, I pay for many of my teens’ everyday expenses. Even though they each have savings from summer jobs. And I’m happy to do so, like many parents. But, I want to make absolutely sure my teens know exactly how much those everyday items cost. Even if I’m paying for them. Financial ignorance might feel like bliss now, but it sure won’t later. So, how do I make sure my teens are fully mindful of the money I’m spending on them? Make them spend it first using their own account, card, or cash. Make them itemize the expenses. Make them formally request a reimbursement after subtracting out any items or portions of items we’ve agreed are their responsibility. Only then will I send them money to cover — or partially cover — the transactions. So, your teens may not be able to afford everyday items yet, but they still need to learn exactly how much those items cost. Make them active participants in the everyday expenses you’re picking up. That way, your teens will already know — and appreciate — the real value of a dollar when the day comes for everything to be on their nickel. Nice people finish last, right? Nope. 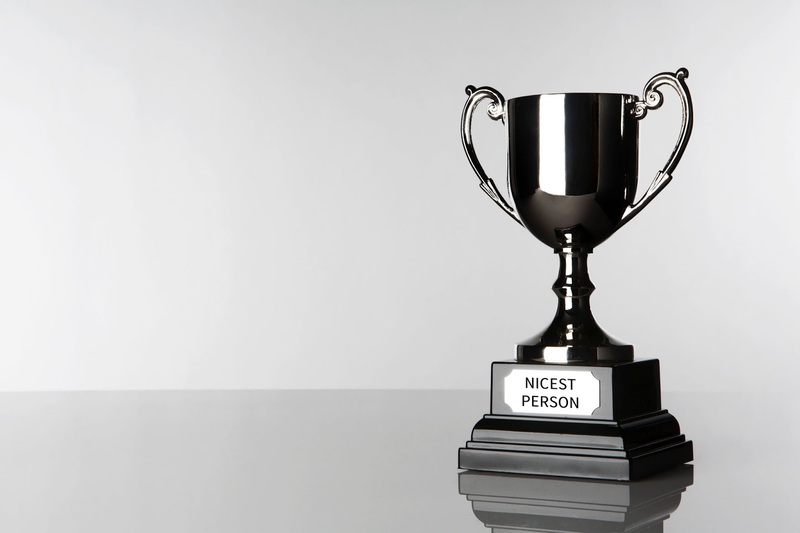 Work: Nice people get better performance reviews from senior supervisors. Nice people are less likely to be fired. Happiness: Small daily acts of kindness raise one’s self-judged happiness. The article goes on to recommend a simple strategy for learning to be nice: imitate a nice person. So how do we teach our kids to be nice? Well, we all know who they tend to imitate, don’t we. The apple doesn’t fall far from the tree. So let your kid catch you doing plenty of nice things. Such as? Smile and be friendly to those around you for starters. Then try a few small random acts of kindness like the ones here. Before you know it, you’ll be nicer, you're kids will be nicer, and you’ll all be winners at work, in relationships, and in your own mind. Sounds like a bargain. Being nice costs you nothing yet pays huge dividends. It’s one of those rare cases in real life where everyone really is a winner. 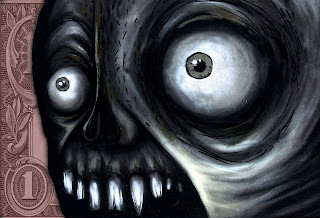 If too much candy is the treat, a stomach ache and a mouthful of cavities will end up being the trick. 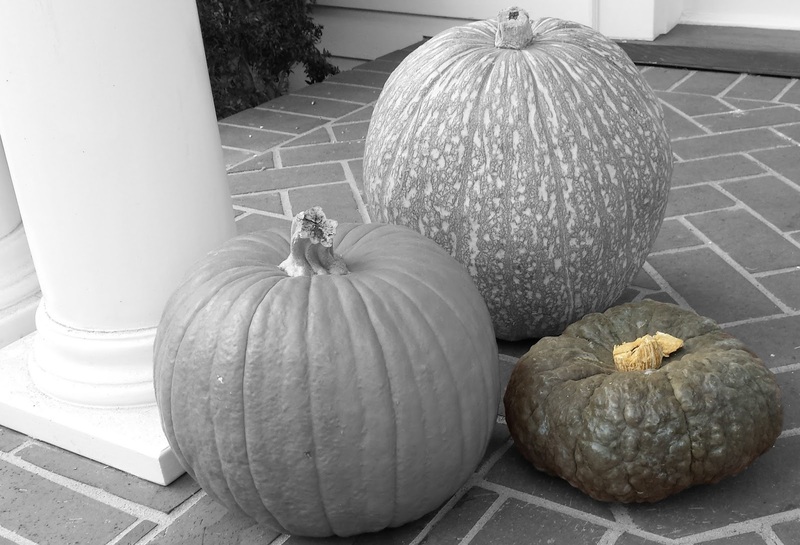 So how do you restrict your kid’s candy intake without being a Halloween buzz killer? Offer your kids a candy buy-back program for their excess treats. Pay by the pound, or come up with a chart of trade-in values for different categories of candies: mini to full size. I’d keep the trade-in details a secret until the next day. That way, your kids won’t run around the neighborhood trolling for specific items. Last year, credits for Halloween candy exchanges on our family finance site were typically in the $3 to $9 range with the highest being $20. That’s quite a haul! Several of the credits were split between spending, saving, and giving. Impressive. What can you do with the purchased candy? Eat it yourself. Probably not a great idea, but, hey, you deserve a treat every once in a while too. Save it for your cheat days. Save it for party favors. A candy stash can come in handy for your kid’s next birthday party. Add a few treats to each party favor bag. Foist it on your office mates. Why mess up your own diet? Sabotage your coworkers’ diets instead. If you don’t want to buy your kid’s excess candy, a local dentist might. 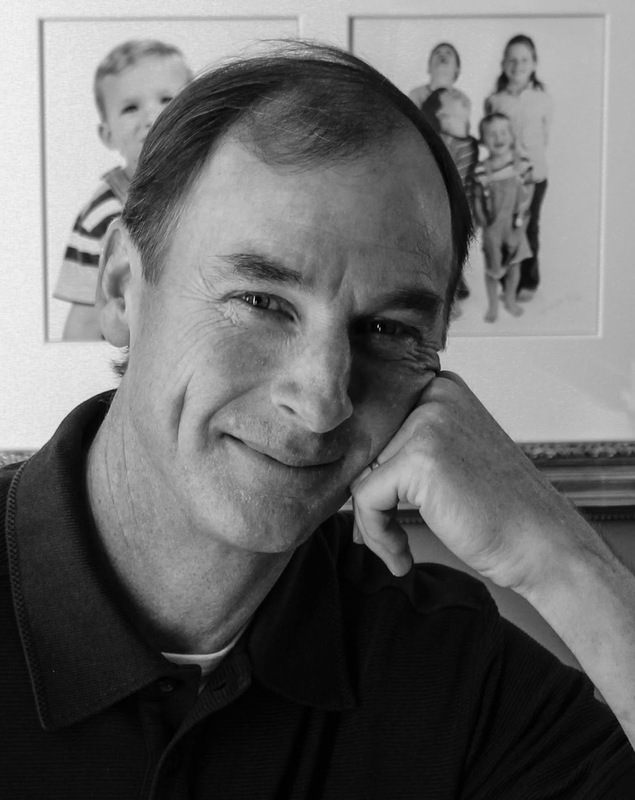 See if one is participating in the Halloween Candy Buy Back program founded by Wisconsin dentist, Chris Kammer. You can look up participating dentists by zip code on the program’s web page. I found two in my neighborhood. According to the FAQs on the site, the most common payout by participating dentists is $1 per pound. Another organization, The National Financial Educators Council, is taking the candy for money exchange idea one step further. They advocate cutting out the middle man altogether. Stop handing out candy in the first place, and hand out money at the door instead. Yikes! I’m not biting on that suggestion. Kids going door to door saying “Trick or legal tender?” Nah. Let’s keep the trick-or-treat tradition intact on Halloween night and moderate the consumption afterwards with a parental candy buy-back program. That way, your lactose intolerant daughter won’t be stuck with a (well-meaning) gift card to Ben & Jerry’s. Or, your son, now burned out on that burrito addiction, won’t be burying that (well-meaning) gift card to Chipotle. No sense letting those nice cards go to waste. Now your kids can spend the balance on something they really enjoy. Or, maybe even put that money to work by earning some sweet Bank of Mom/Dad interest. 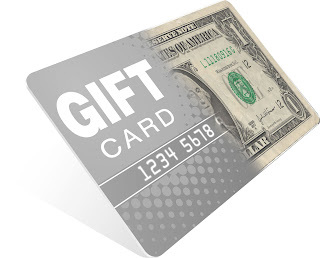 What to do with all the gift cards you collect? Use them. Just because your son has Chipotle fatigue and your daughter is lactose intolerant doesn’t mean you can’t enjoy some burritos and ice cream! And what parent can’t use up a Target card in a heartbeat. Regift them. Always good to have a stash of cards around for that last minute birthday party your kid forgot to mention. Sell them. 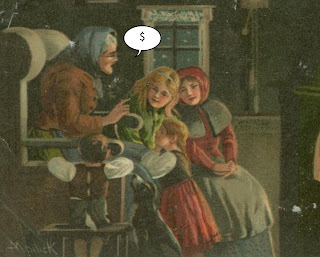 Someone else in the family might want to buy a coveted card from your stash. Or, if you’re willing to accept a discounted price, you could sell them online. With your own family gift card exchange, you’ll help chip away at the billion dollars that’s left on the table — or in a sock drawer — every year. Also, no more long faces when Aunt Millie delivers that well-meaning but off target gift card either. Win, win. Kids lose stuff. That includes payment cards (which is one of the many reasons you don’t want kids running around with yours). I ran some stats on our family finance site to see how common losing a card is. 5.7% of non-parent FamZoo cardholders have ordered at least one replacement card. The worst offender has ordered a grand total of 6 replacements. Doh! 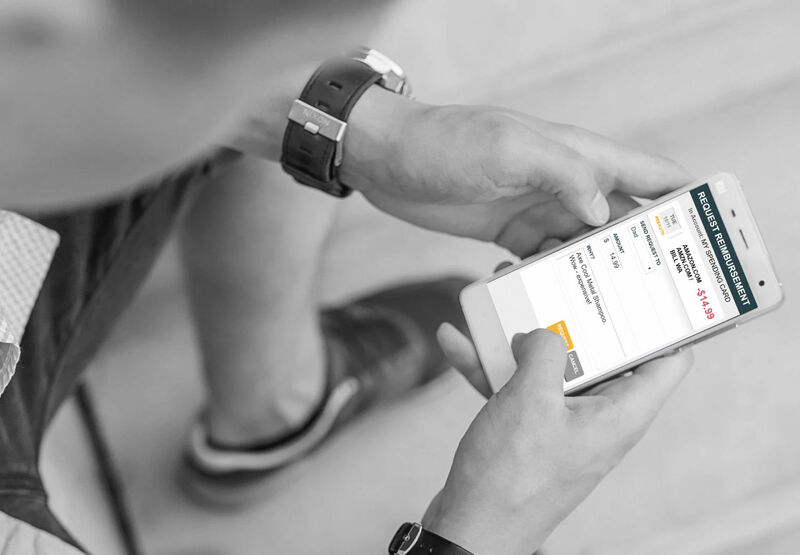 Receive real-time alerts whenever there’s any activity on the card. That’s often your first clue that the card is no longer in your teen’s pocket. Lock the card immediately from an app or web application as soon as it goes missing so nobody can use it in the meantime. Transfer funds off the card immediately so you have access to the funds elsewhere — on another card or in another account. Order free (or cheap) replacements with minimal hassle. But what if all of those conveniences make your kid cavalier about losing cards? Shouldn’t there be some consequences for being careless with money? Indeed. So consider imposing a parent penalty for lost cards. Maybe even ratchet up the amount for repeat offenses. A warning on the first one, $5 for the second, double it for successive ones. What do you do with the fees collected? Perhaps sweep the impounded funds into the family swear jar. Also, before you rush to order that next replacement card, consider just locking it and waiting 24 hours instead. Many a FamZoo card has been found beneath a teen’s pile of dirty clothes. 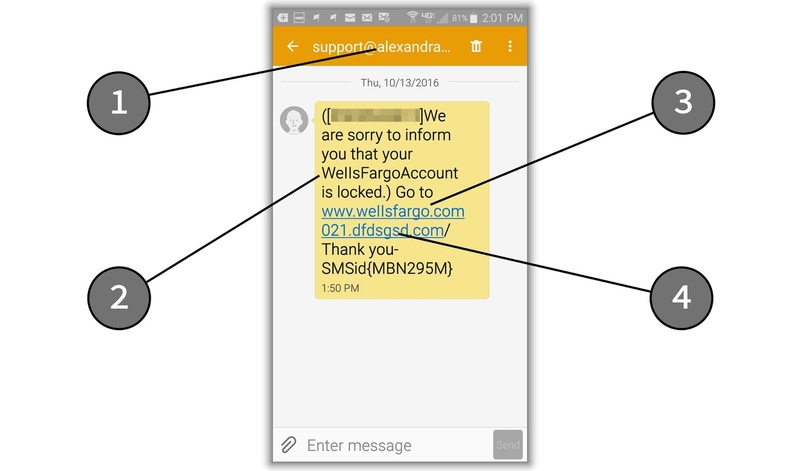 Here’s a video version of the post: Teach Kids A Simple Secure PIN Strategy. 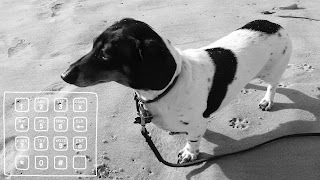 Remember this phrase: Colby the dachshund rocks! Meanwhile, the world is going cashless. So it won’t be long before your kids are using PIN-based payment methods like prepaid cards or bank debit cards. Using them responsibly includes learning how to pick a secure, but memorable PIN. Parents definitely need to step up the education here. How do I know? In the last 30 days, the third and fourth most common reasons for declines on kids’ FamZoo cards are PIN related. Pick a memorable four word phrase. Maybe a song title, part of a favorite lyric, a statement about your beloved pet, whatever. Just make sure it isn’t something someone else can easily guess. Map the first letter of each word to a number using a phone keypad. Bring up the dial pad on a cell phone, and look up the number for each letter. For example, 2 corresponds to A, B, or C. So, the phrase “My Dog Has Fleas” maps to 6 3 4 3. You’ll notice 1 and 0 don’t have any corresponding letters, so you could make up your own mapping there. So 1 could be an exclamation point capping off a three word phrase. Repeat until secure. If your phrase maps to something too obvious, like too many repeated or consecutive numbers, just try a different one. Keep a keypad cheat sheet. Print out a keypad image to keep in a wallet or purse for times when a phone isn’t handy. That’s it! No more bad PINs. No more forgotten PINs. 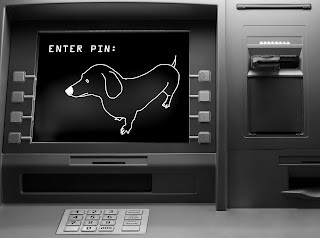 So, what’s my secure dachshund PIN? You got it! 2 8 3 7. Don’t worry though. Colby the Dachshund still rocks, but I changed my PIN. Asking mom and dad for extra money is a little too easy. Not that kids are nefarious or anything, but harried parents are a pretty easy con. Force your kids to write them down. Running Total for the week or month. 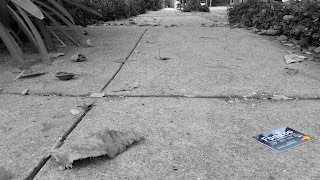 Coming up with a written justification and confronting the reality of their recent request history so will often be enough to stifle impulsive asks right away. If not, you’ll have the advantage of glancing over the recent history too. No more exploiting our parental senior moments. 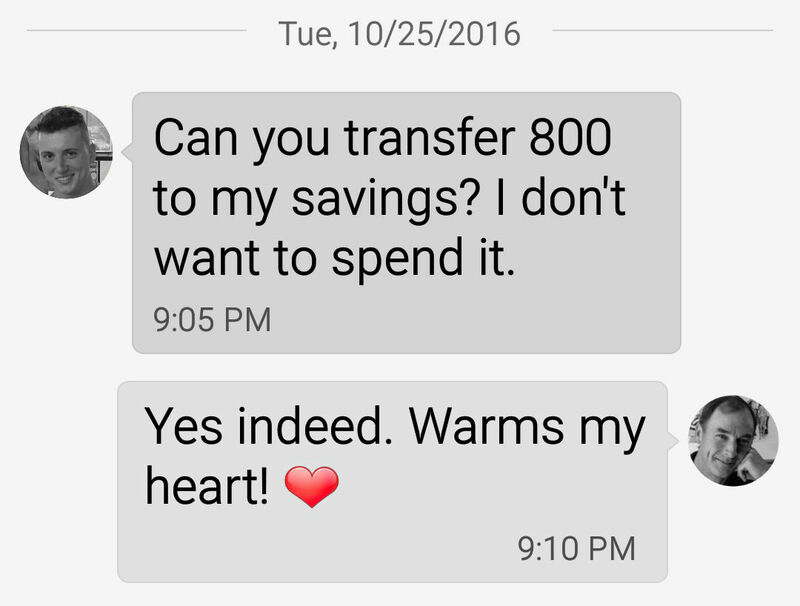 All that said, if you’re handling a ton of random money requests from the kids, you may need to fix the way you’re doing allowance instead. I’ve written before about how I like to use a simple reimbursement process with my teens to force awareness of how expensive everyday life is. To recap: If I just buy everyday items for my teens outright, the costs are out of sight, out of mind. But if I make them buy the items first and request reimbursements from me afterwards, they can’t help but notice the prices. See more about my reimbursement process and policies here. 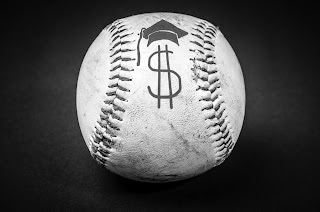 Beyond learning the value of a dollar, I realized there’s an unexpected extra benefit to the reimbursement system: it conditions kids to maintain a minimum balance — a “spending buffer.” Without it, they can’t buy the item in the first place. At least, not without some parental hassle. A spending buffer is an excellent personal finance habit. It wards off embarrassing declines or painful overdraft fees. It averts monthly fees for accounts that have minimum balance requirements. So, try moving to a simple reimbursement process for the things you’re currently buying outright for your teens. 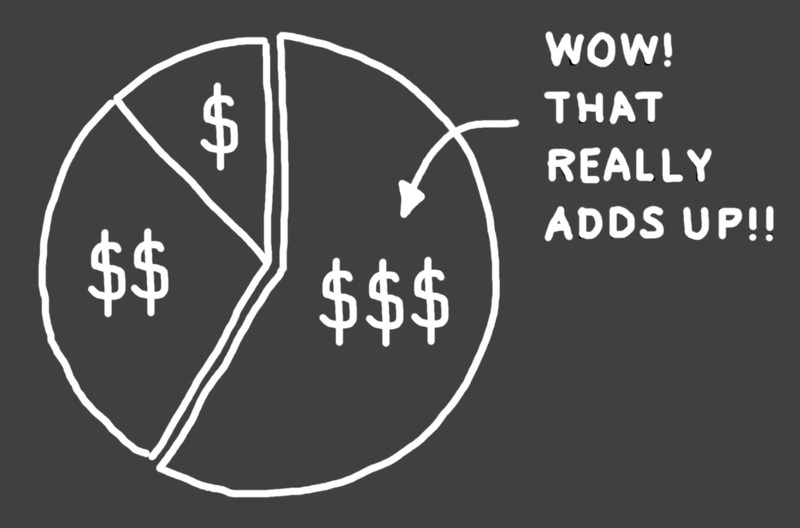 They’ll get a financial education two-fer: cost consciousness and spending buffer savviness. Your teens are old enough to know that businesses can’t survive long if they don’t make money. So, if a mature business offers a service for free, it’s making money elsewhere. Savvy consumers figure out where. Then they remain on guard for the inevitable promotion of that other thing. And its promotion can be extremely subtle, if not downright shifty. Free checking services from banks are a perfect example. If a checking account doesn’t have a monthly service fee, where are banks making their money? One key answer: overdraft fees. So what should savvy banking consumers be on their guard for? 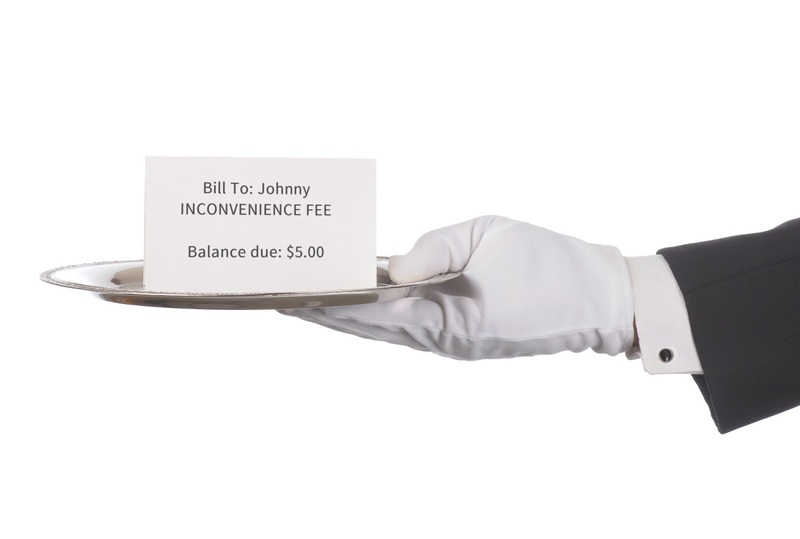 Sneaky ways to get them to cough up overdraft fees. If you want to avoid overdraft fees, surely it makes sense to have “overdraft protection”, right? The overdraft “protection” option is the very mechanism banks use to convince consumers to “opt in” to paying unnecessary overdraft fees. Why? Because since Regulation E passed, consumers have to explicitly opt in to be charged overdraft fees in most cases. Why would anyone opt in to paying fees? Because they’re confused. Ironically, you have to opt out of all overdraft protection options to protect against overdraft fees. And don’t expect your bank teller to make that clear. If anything, expect the opposite. Don’t believe me? Read this. In fact, just last month, my colleague walked into that very same bank to tell them in no uncertain terms that he did not want any overdraft fees assessed to his son’s checking account. The branch employee assured him that overdraft protection services had been dropped. My colleague walked out thinking the matter was settled. But, nooOOOoooOOO. A week or so later: another overdraft fee. What? On to the 1-800 customer support line. Ahhh, it turns out the branch employee cancelled one overdraft protection service (the savings account linkage to checking), but not the other (debit card protection). Mind you, my colleague made the goal very clear the first time: NO avoidable overdraft fees on his son’s account in accordance with Regulation E. In any case, problem solved now, right? NoooOOOooo. Days later: yet another overdraft fee. What the...? So, back to the 1-800 number. When my colleague expressed his exasperation at being charged yet another overdraft fee, it triggered an escalation to a dispute manager. Apparently, “you guys already have a bit of a reputation for fleecing customers” is a hostile “trigger” phrase. The dispute manager was in turn unhelpful, defensive, and, it turns out, uninformed about the nuances of overdraft regulations. SoooOOOooo, back to the local branch. My colleague called to make a second local appointment to hash things out in person with the branch manager. Fortunately, during the call, the manager finally realized that the last overdraft fee only occurred because the removal of the debit card protection takes several days before it goes into effect. The overdraft had come in during that delay. Well, that at least explains it. But the mind boggles that such delays exist in the Internet age, doesn’t it? Hmmm... fishy. The point of the story? Let your teen know that if a service is free, you can bet there are hidden fees elsewhere. Find them. Know that business will go to extreme lengths — sometimes even illegal ones — to get you to pay them, so remain vigilant. Ironically, a free service can be more expensive than a paid one — especially for those consumers who can least afford it. In the free checking case, it’s the consumers with chronically low balances who are subsidizing the service for the others. And who’s a classic consumer class with low balances? That’s right. Your teens. 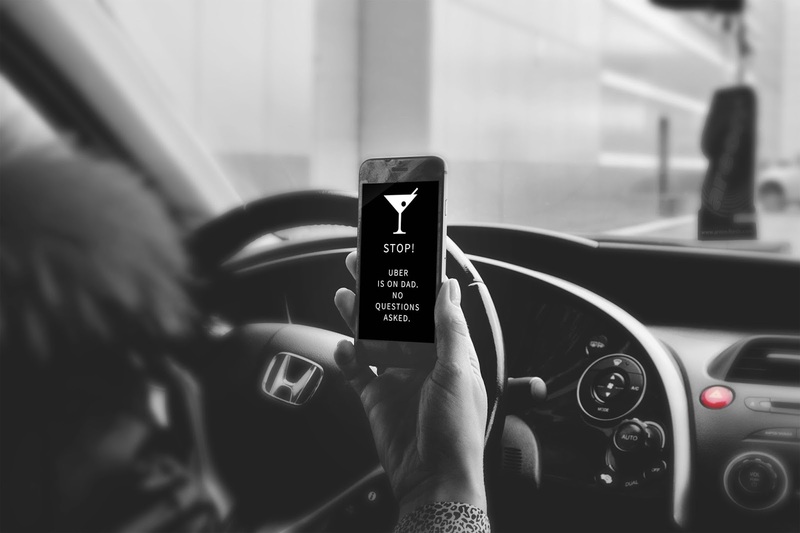 I never want my teens driving after drinking. I never want my teens getting a ride from someone else who’s been drinking. I never want money or guilt to get in the way of those two decisions. Are you struggling to turn your kid’s positive money behavior into a consistent habit? Maybe your kid just doesn’t think frugal behavior is “cool” or relevant. Try fusing the behavior with part of your child’s core sense of identity. That’s one of the 21 habit forming strategies described in Gretchen Rubin’s book Better Than Before. Here’s how it works. Let’s say your kid is really into rap. 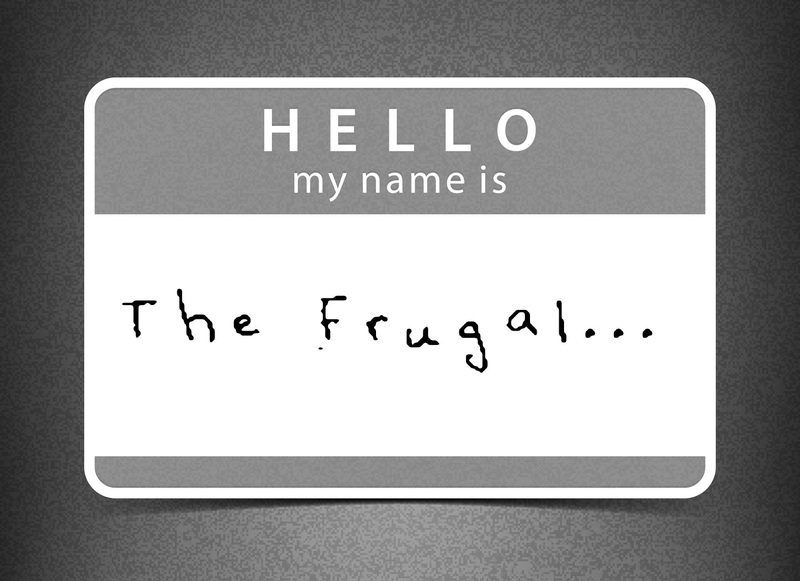 Encourage your kid to identify as the “frugal rapper.” Sound crazy? After all, rapping and frugality are in conflict, right? Well, that’s exactly what rapper Dee-1 did. 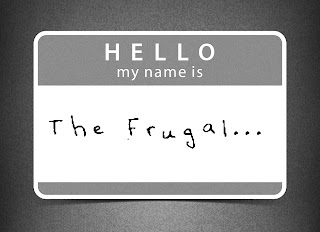 Check out the frugal rapper’s story here. Is your kid a rocker? How about identifying as a frugal rocker like the members of the band Gooding. Is your kid into sports? How about identifying as a frugal star athlete like Redskins quarterback Kirk Cousins? Just a typical teen? How about identifying as a teen who’s “got cents” like Eva Baker? A string of modest used cars later, it’s still part of my persona. I just choose to spend my discretionary funds on other things. Things I really care about, like my family and my home. Self identifying as the “software guy with the crappy car” helped me resist the occasional fleeting temptation to buy a fancier car when my heart really wasn’t in it. The bottom line: when good money habits are a part of your core identity, it makes it much easier to resist financial temptation and peer pressure. What frugal persona can you help your kid adopt? 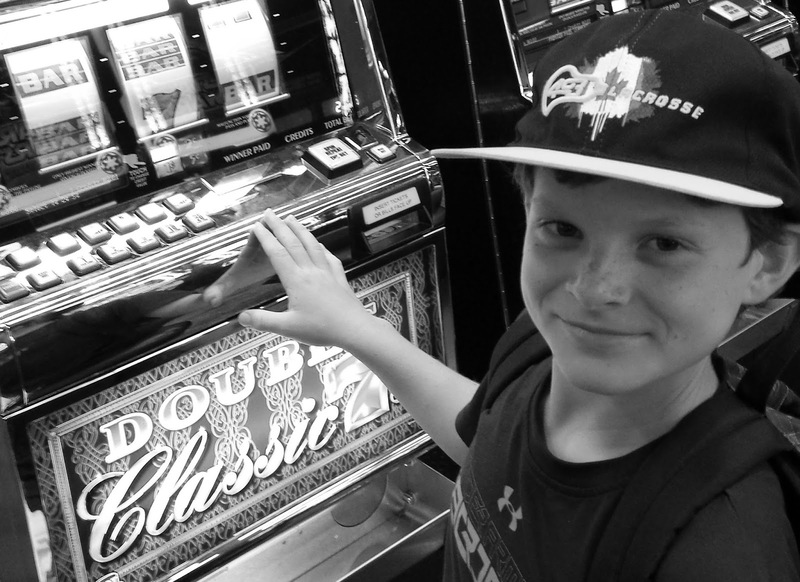 Know If Your Kids Are Gambling With Gaming Currency. 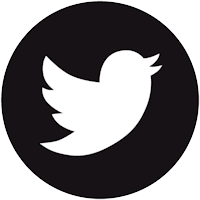 in their account histories or card activity alerts. They’re just buying games on one of the most popular digital gaming distribution platforms, right? Or, maybe your kids are purchasing digital gaming currency. Why? To buy and trade digital in-game items, like “skins” in the popular game “Counter-Strike: Global Offensive” (aka CS:GO). Skins are nothing more than decorative textures for game weapons. They’re purely cosmetic. If your child is wasting hard-earned money on in-game vanity items, that’s probably something you’ll want to discuss. On marketplace sites like BitSkins, gamers speculatively trade digital game loot in hopes of turning a profit. If your child is engaging in market speculation on unregulated sites, that’s probably something you’ll want to discuss. Or, maybe your kids are using digital gaming currency to gamble on the outcomes of online competitions or casino style games. Apparently, kids can use their Steam credentials to seamlessly log into gambling sites and place wagers using skins. That has prompted the Washington State Gambling Commission to demand that Valve Corp (the makers of Steam) prove it isn’t helping turn teen gamers into gamblers. 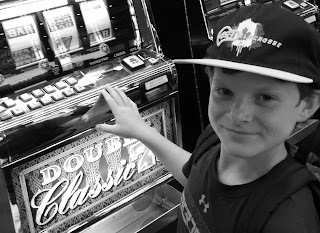 If your child is gambling, that’s definitely something you’ll want to discuss. If your kid’s a gamer, it’s time to conduct a non-judgmental spending audit. Make sure that gaming habit isn’t becoming a gambling habit. Spending? Check. Savings? Check. Giving? Check. 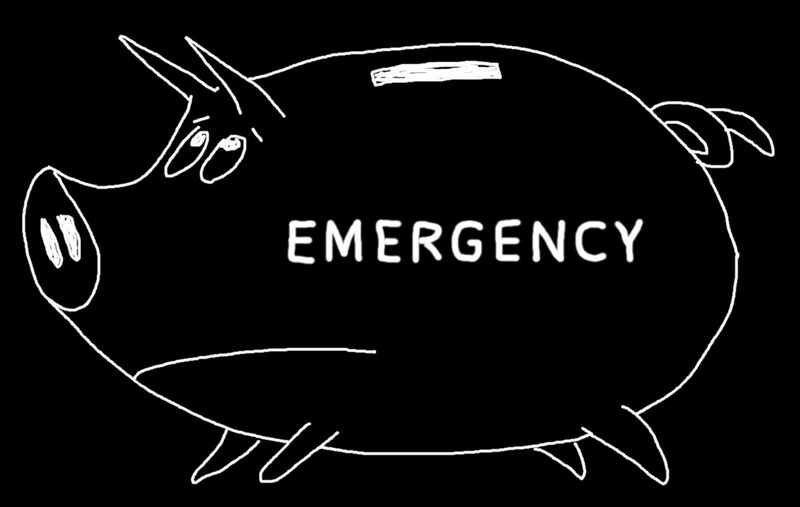 Most people don’t learn about emergency funds until they’re off on their own. Usually it’s after they’ve already dug themselves into a big financial hole. That’s why an emergency fund is step #1 in Dave Ramsey’s famous 7 baby steps for getting your financial you-know-what together. But what if we taught people about emergency funds much, much earlier? Like childhood. The hockey puck through the garage door window. The massive data plan overage charge. Ringing a bell? If your family’s anything like mine, your kids will have plenty of chances to cough up some emergency cash. 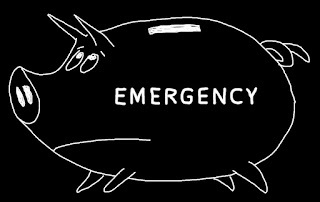 Set up a separate emergency fund for your kid. Add an extra jar, envelope, account, or prepaid card to your kid’s standard set of buckets. Divert some income to fill the fund. Change your kid’s spend-save-give allocations on allowance, odd-job, or birthday payments to factor in the new emergency bucket. You can change things back once they hit the target — maybe $25 for a youngster, $100 for a pre-teen, $250 for a teen. Share some skin in the next emergency. I say share because some emergencies may extend well beyond your kid’s means. Sharing the costs on a case-by-case basis is fine. As long as there’s some shared skin in the game, the lessons will be learned. Replenish the fund. Return to step 2 to refill the emergency bucket. Rinse and repeat as the emergencies roll in. If you take that baby step now on emergency funds for your kids, maybe they won’t be crawling out of debt later as young adults. With everything going cashless, it won’t be long before your kids are using PIN-based payment methods like reloadable prepaid cards or bank debit cards. Using a card responsibly includes learning how to pick a secure but memorable PIN. Parents definitely need to step up the education here. How do I know? 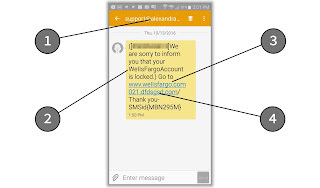 Because in the last 30 days, the third and fourth most common reasons for declines on kids’ FamZoo prepaid cards are PIN related: incorrect PIN entries and security holds due to too many failed PIN attempts. Together, the PIN issues make up 13% of all declines. Pick a memorable four word phrase. Maybe a song title, part of a favorite lyric, a statement about your beloved pet, whatever. Just make sure it isn’t something anyone else can easily guess. Map the first letter of each word to a number using a phone keypad. Bring up the dial pad on a cell phone, and look up the number for each letter. For example, 2 corresponds to A, B, or C. So, the phrase “My Dog Has Fleas’ maps to 6 3 4 3. You’ll notice that 1 and 0 don’t have any corresponding letters, so you can make up your own mapping there. Maybe 1 could be an exclamation point capping off a three word phrase. Repeat until secure. If your phrase maps to something too obvious, like too many repeated or consecutive numbers, try a different one. Keep a keypad cheat sheet. Print out a keypad image and keep it in your wallet or purse in case you don’t have a cell phone handy. So, what’s my secure dachshund PIN? P.S. Not to worry, I don’t use that PIN any more, but Colby still rocks! P.P.S. In case you’re curious, the number one decline reason at a whopping 57% is insufficient funds. That’s a different problem for parents to tackle. Here’s one solution. You’ve seen the embarrassing moment in baseball. A towering fly ball is hit to an open space between fielders. Both players rush over. Both pull up short. The ball drops to the ground between them. Doh! Is that what’s happening to your kid’s financial education? Multiple adults are rushing around frantically with none catching the responsibility? Who’s taking the lead on teaching your child the basics of personal finance? So who’s saying “I got it” in your family? Whatever you do, don’t let the ball hit the ground. To help teens identify the leaks sabotaging their money row boats, conduct an occasional spending audit. If your teen’s spending is confined to a prepaid card or a bank debit card, the steps are easy. Pick a time-frame. 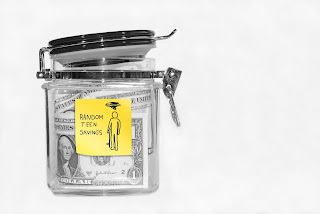 A month works well for older teens who have regular discretionary spending. Longer periods make sense for younger kids who spend less frequently. Export the transactions for the period. Good online banking or card offerings will have a simple way to download transactions for a specific time period into a spreadsheet. Identify a few key categories. Eyeball your teens transactions and look for just a few common recurring categories. Fast food? Online gaming? Starbucks runs? Keep it simple and relevant here. Add a category column. Add a column to your spreadsheet that assigns each transaction to one of the handful of categories identified above. Draw a clear picture. 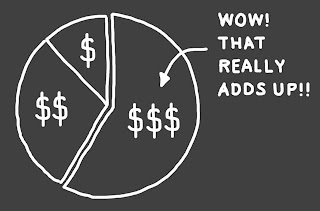 Make a simple pie chart or bar chart that highlights the total spending by category. Discuss, don’t judge. Discuss the results casually without judgment or emotion. If you can’t, find the spouse, partner, relative, or mentor who can. You want to lay the groundwork now for financial transparency and consultation later when the stakes are much higher. Keeping the audit simple and non-judgmental is critical! Bingo! That’s how kids learn to right their own financial ships. Money directives hurled at your kids — “Don’t do this! Always do that!” — have a way of going in one ear and right out the other. Try a real money story featuring yourself instead. When your mom and I were first married in the mid ‘80s, the second generation Jeep Cherokee was all the rage. In fact, it was the pioneer of the modern SUV and the object of desire of hip young couples everywhere. You know, like your mom and I. So, naturally, I thought we had to have one. I took your mom down to the car lot one weekend where we found a fire engine red Cherokee. The salesman assured me it was an ‘amazing’ deal and how lucky we were to snag it. The other salesmen all gave us big smiles and big thumbs up as we closed the deal. I remember glancing in the rear view mirror to see them chuckling with one another as we drove it off the lot. It gave me a sinking feeling. The first of many. The first time I drove it up a moderate grade, I got another sinking feeling. The 4 cylinder engine was completely gutless. Known problem. Should have got the 6. When we drove from LA to my parent’s house near SF, we got another nice little surprise. Unbeknownst to me, that model was notorious for its shoddy radiator. Sure enough, we wound up stranded late at night on the side of Highway 5 in the middle of nowhere. We were halfway through our 400 mile trek with steam spewing out of our radiator. I cursed a blue streak as tried to flag down trucks barreling by. My frantic efforts were in vain. I probably looked slightly on the edge of sanity. Anyhow, after a little trucker-savvy jury rigging of the radiator, we were back on our way. I now had a nice 200 mile stretch to think about how quickly I could unload that piece of junk Cherokee. So kids, the next time you’re considering a big purchase, just think of me and my crappy Cherokee. Ask yourself whether your ego or your emotions are driving your purchase. And, by all means, do your research before you pull the trigger. Pro tip: the more of a money moron you are in the story, the more memorable and effective it will be. Got a good money story for your kids? If you frequent Starbucks regularly like I do, you’ll notice the habit starts pretty darn early. I often see gaggles of kids hanging out there before and after school. Which got me to thinking: I wonder what age the Starbucks habit kicks in these days. 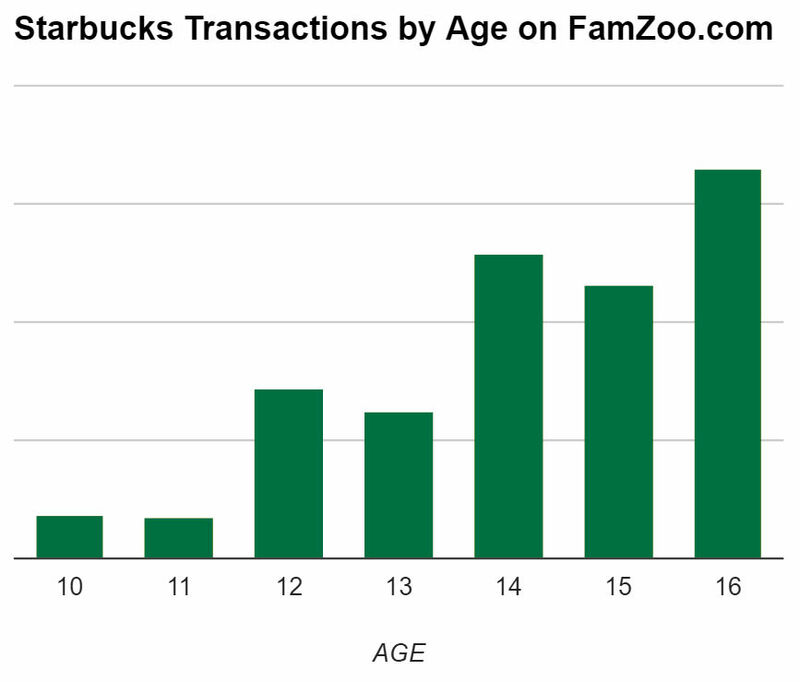 So I sifted through FamZoo.com transactions over the last year to find the answer. Here’s what I found. It kicks in significantly at age 12 and takes it up another big notch at age 14 (see chart). That makes sense. The first bump roughly coincides with the passage into middle school and the second with high school. Those are two classic transitions where kids naturally enjoy more independence and an increased desire to emulate adult habits. So, is this early Starbucks affinity bad? Well, I can certainly think of much worse places for kids to hang out. In the grand scheme of things, Starbucks is a clean, safe, and harmless social venue. But it is pricey. 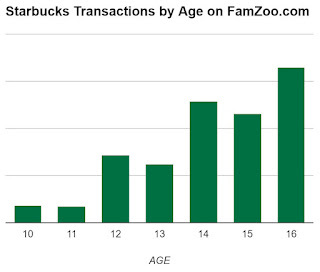 The average transaction amount we see for a 14 year old is $6.26. That’s right up there with what we found for average fast food purchases by kids. 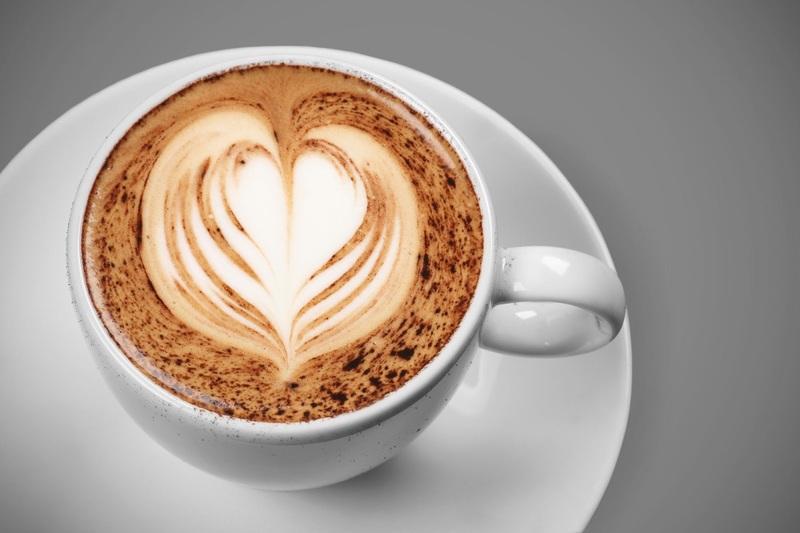 Realize that kids will come under increasing peer pressure to make outings to Starbucks (and other popular establishments) as they transition to middle school and onto high school. Set some budget boundaries ahead of time to keep spending under control. Arm your kids with some preemptive money conversation scripts to avoid awkward interactions with friends while politely declining to overspend. Just a few things to ponder over your next pumpkin spice latte. Seeing what kids are saving for can be revealing, amusing, classic, impressive, and even inspiring. Harry Potter Hermione “...I’m Highly Logical...” Magnet. LEGO Super Heroes Jokerland Building Kit. Lil Woodzeez Family Treehouse 22-Piece Playset. An adoptive family travel heritage trip to Guatemala. Rick Riordan’s Magnus Chase and the Gods of Asgard book series. The Pokémon Sun game for the Nintendo 3DS. Summer camp (with a savings match from Mom). An investment in the stock market. Birthdays, Father’s Day, Mother’s Day, Christmas, and more celebrations. Seed funds to start a company at 18. A puppy, including transportation and vet visits. A car by Summer 2023. 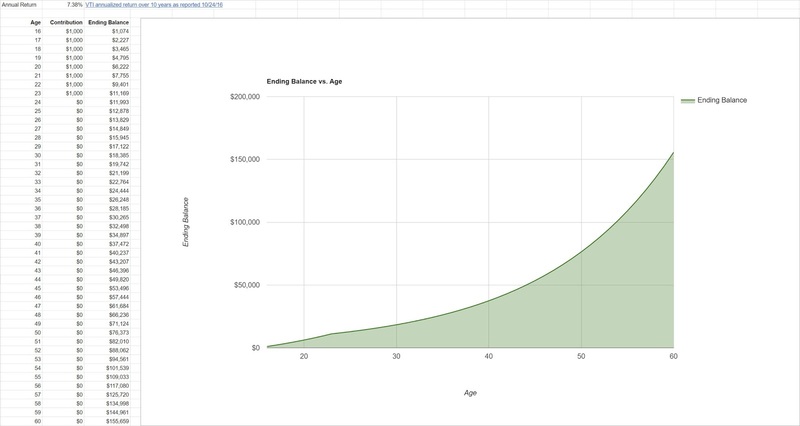 A $500 emergency fund by age 18. A phone insurance fund (in case it’s broken or lost). Hamster cage, bedding, and food. Donation to Alzheimer’s disease research. 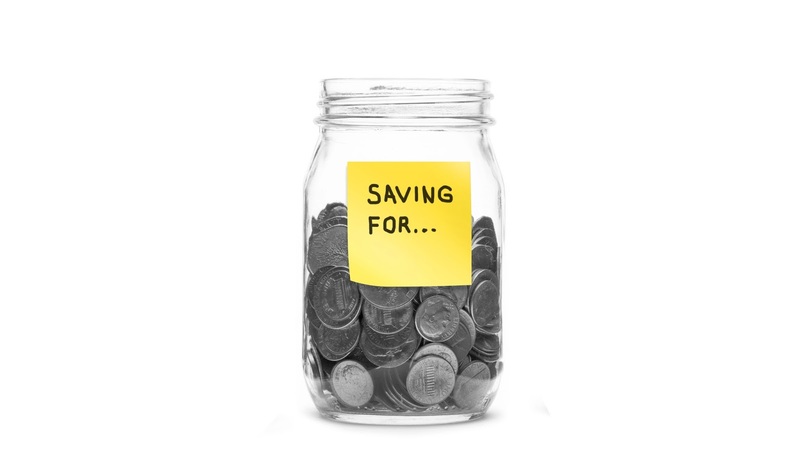 What’s your kid saving for? See anything on that list that makes you want to sit down and have a saving discussion with your child today?